Harry and Poppy had a wonderful festival style wedding reception at Rock Village Hall. The couple had always dreamed about getting married under a large English Oak tree in the middle of a field, and their search for this led them to Rock Village Hall. The field in which the oak tree stood didn't belong to the village hall, so the couple had to get special permission to use the site. The outdoor wedding was stunning, and everything that the young couple had hoped for. After the ceremony, we took a few formal photos with the family and wedding party whilst most of the wedding guests were getting food which was provided by a mobile crepe van. Of course I say 'formal' but with this happy go lucky, they were anything but formal. As the wedding was outside and in the middle of August, the mother of the bride had had enough fore thought to order a bucket load (literally a bucket full) of sunglasses that were free for the wedding guests to use. 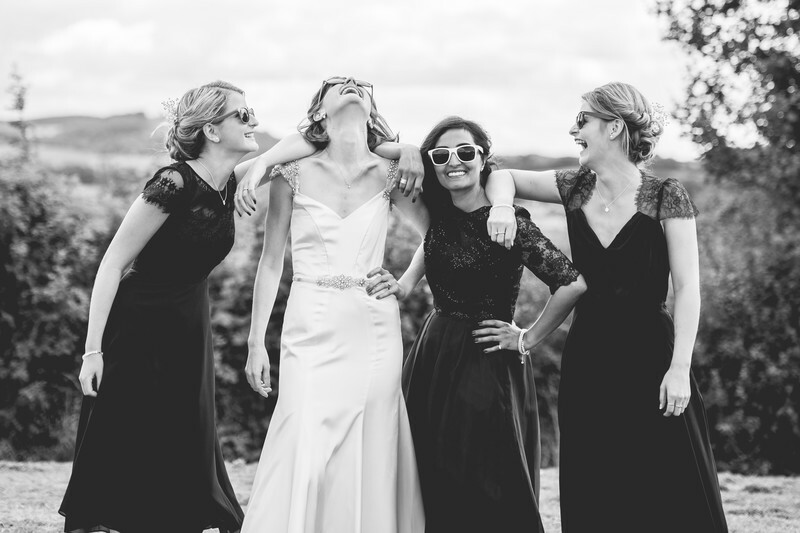 The couple were keen to echo their laid back approach to the wedding in their photos too, so I gathered sunglasses of various colours and gave them to the bride and her bridesmaids. Then I just let the girls be themselves, and it really wasn't too long before we were getting some amazing photos. This is one of my favourites - I didn't hear what was said, but it was clearly hilarious and makes for a wonderful wedding photo! Location: Rock Village Hall, Bewdley.